Luke prepares himself to walk into the office party. Despite his reputation as the most helpful and productive salesperson in the company, his self-confidence flies out the window when he has to face people socially. “I never fit in anywhere,” he thinks to himself. Feeling numb, isolated, empty and alone, these men mistake their intense individuality for strength. But since they are out of touch with their own feelings, they sense that they lack some vital ingredient that other people have; and deep down, they feel overlooked and unseen. These are the men of Childhood Emotional Neglect. They are men who grew up in households where their feelings didn’t matter. A new study by Spalek et al., 2015 provided new evidence of how men and women process emotion differently. Men’s brains are less reactive to emotion, and men remember emotional images less well than women. This makes emotional responsiveness and validation from parents extra vital for boys. Boys who don’t receive enough grow up to be baffled by all things emotional. Children are highly adaptive creatures. Boys who grow up this way do what is needed to get along in their family home. They push their own emotions and needs down and away, so that they will not be seen or felt. As men, they live their lives virtually walled off from the most intensely personal, vital part of who they are, their emotions. Tear down your wall. The wall that you put up as a child between yourself and your feelings is still there. Sadly, it now also stands between you and the people who love you. It was there to protect you through your childhood, but you no longer need it. Allowing yourself to have emotions and needs will make you stronger. You may pride yourself on your unemotional nature and fierce independence. But as an adult, having few feelings or needs is no longer a strength. Real strength comes from knowing when you feel something or need help and being willing to accept it and share it. You do fit in, you just don’t know it. It is understandable that you so often feel overlooked. But it’s not because you don’t belong, or because you’re less interesting or vivid than other people. It’s because your emotions are a magnet which draws others toward you and connects you to life. Since yours are walled off, you are operating without enough of this vital ingredient. You may feel empty sometimes, but actually nothing is missing. It’s your emotions, and they are there. They are behind the wall. You can fix this. You can be much happier than you are now. You can feel more connected, you can feel more love. You can feel more. Open your heart to the people who love you most: your spouse, your children, your siblings and friends. Allow them to care for you as you care for them. Let your loved ones help you break down your wall. 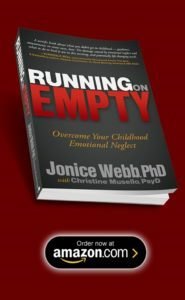 To learn more about Childhood Emotional Neglect, its causes, and how to heal from it, see the book Running on Empty: Overcome Your Childhood Emotional Neglect. 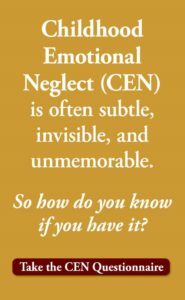 **Special Note to Family Members: If you have a CEN man in your life, husband, father, brother or friend, there are things you can do to help. 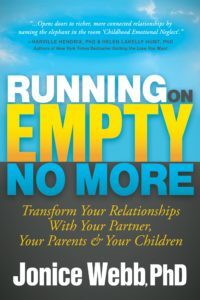 Send him a link to this article, ask him to visit the website above, read Running on Empty yourself and/or give him a copy. Tell him you love him and want to be closer to him. Try to be patient because it’s not his fault. He needs you. And he has some work to do. Easy to say “tear down the wall”. How? I read lots of articles that support me having CEN but find little help in actually addressing it. A great article Dr Jonice. My husband is “emotionally disconnected”. I know it’s in there somewhere and occasionally it can be seen. He thinks any show of emotion is a sign of “weakness”. He was sent away to boarding school at 8 and his parents were verbally and physically abusive towards each other and used him as a pawn in their struggles with each other. I’ve been talking about CEN to him but I don’t expect any changes overnight. Definitely a work in progress!